After realizing my ancestors served in the 69th Indiana Infantry, I've before a bit obsessed with tracking down and learning the stories of all the boys of the 69th. This is the story of Isaac ALGER. Isaac was born in 1838 in Virginia. He mustered in to the 69th Indiana Infantry, Company H as a private on 19 Aug 1862. On 24 Nov 1863 Isaac was wounded in battle. He was discharged due to his wounds. On 12 Oct 1867 in Henry County, Indiana, Isaac married Mary MATHEWS. They remained in Henry County, Indiana but I don't believe they had children of their own. On 18 Mar 1894, at about the age of 56, Isaac died. He is buried in Painter Cemetery in Middletown, Indiana. Isaac's memorial at Find A Grave can be found here. I'd love to share information. I have some of his documents and I've written about him. He's buried in Ridge Cemetery in Richmond, Indiana. I descend from Mary Mat(t)hews who married Isaac. I have Isaac's Civil War pension file. I suspect he was born earlier than you specify, but his year of birth is not clear, and the same is true for his prior marriage(s). 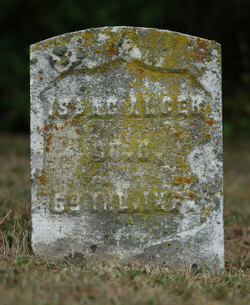 Thank you for that information on Isaac Alger. If you have any updates please let me know. I'm interested in all of the boys from the 69th!